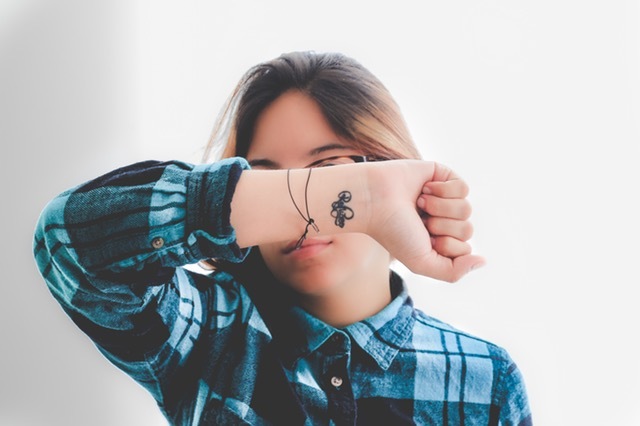 For as long as we can remember, tattoos have been a form of art—a way for us to express ourselves with personalized designs. But researchers from MIT and Harvard Medical School are turning the tattoo into an interactive way to learn about our health. Sounds so sci-fi, doesn’t it?! Welcome to 2017. Researchers used biotechnology to create a tattoo ink that changes color on the surface of your skin, depending on factors such as your blood sugar and sodium levels. The project is called DermalAbyss, and it could be a game changer in the world of health and wellness. DermalAbyss tattoo ink measures the changes in interstitial fluid, which makes up about 16 percent of the human body weight. It’s the matter that exists between cells. In order to track your glucose levels, you watch whether the color changes from blue to brown, indicating that your blood sugar has risen. This will make life much easier for people with diabetes, especially those who have to prick themselves for blood tests every day. They created another sensor that tracks your sodium level. When the color shines green under a UV light, that means you’ve got more salt in your system than before. Finally, the ink can change from pink to purple in order to indicate your pH levels. "The Dermal Abyss creates a direct access to the compartments in the body and reflects inner metabolic processes in a shape of a tattoo," the researchers said on their site. Don’t expect to get this kind of tattoo anytime soon, though. The researchers still need to do several rounds of testing before they feel these biosenses tattoos are safe to use on everyday folks. Still, it’s nice to know this kind of technology exists out there, because a lot of people will greatly benefit from it—and they’ll look rad at the same time.